THE WHITE Tigers shared the spoils with high-flying Bath City at Plainmoor. We made a great start to proceedings when Tyler Harvey fired home from a tight angle with just three minutes on the clock to put us in front. As both sides looked to get a foot-hold in the game, Jamie Richards was off target whilst the visitors were similarly wayward with an effort at the other end. In what was developing into a cagey affair, genuine chances were few and far between at either end as the first half went on. We were working hard to frustrate our opponents and hold on to our early lead. 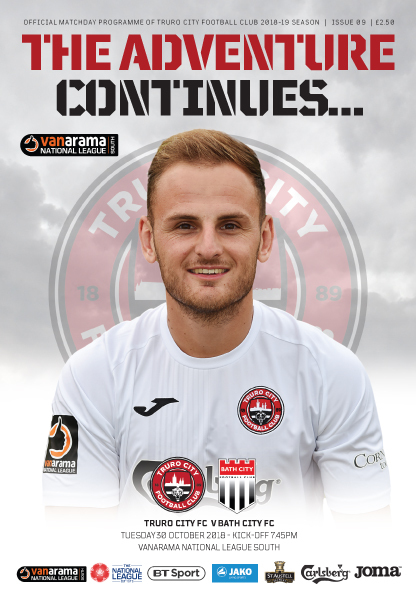 With ten minutes to go until the break, a free-kick was dangerously delivered by Connor Riley-Lowe and as the visitors scrambled clear for a corner, the resulting flag-kick was also cleared under pressure. There was a good opening for the visitors as the interval approached with Cundy snatching at the effort and putting it wide. Moments later a raid of our own saw Tyler Harvey link-up with Riley-Lowe and his effort was well kept out by the ‘keeper. We ended the half playing some neat football but the second period started with an early penalty to our opponents which they despatched to level matters. The equaliser gave Bath a real lift and they were looking purposeful as they were denied by a smart save from Corey Harvey with 50 minutes on the clock. We were having to weather a storm as our opponents had a goal ruled out for offside and then Mann saw his strike well saved by Corey Harvey. As we started to get back into the game, Niall Thompson was unlucky and then a corner from River Allen caused concern for our visitors. We were still having to be wary of Bath on the break as they pushed for a winning goal and an indirect free-kick inside our area after Harvey picked up a backpass had to be bravely defended. It was our opponents who ended the stronger of the two teams and in the closing stages we were reduced to ten men when Tyler Harvey picked up his second yellow card. Despite this we managed to hold on to claim a good and hard-earned point. WHITE TIGERS: C. Harvey, Thompson, Riley-Lowe, Grimes, J. Richards, Harding, Allen (Palfrey 88), D. Rooney, T. Richards (Bentley 90), L. Rooney (Keats 70), T. Harvey Subs not used: Palmer, Copp. BOOKING(S): Harding, Allen, J. Richards.